Since before it even released last year, I had been hearing amazing things about Our Chemical Hearts. It at first didn’t really seem like the type of book I’d love with all my heart, but the hype convinced me to pick it up. I am so glad that the hype sucked me in- I really, really enjoyed this novel! Even though I found that this book was a tad poignant and melancholy, the story was beautiful, meaningful, and extremely well-written. After having read this, I feel the need to pick up and devour many more of Krystal Sutherland’s works. 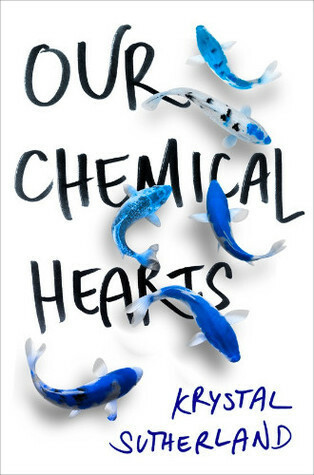 For a plot summary, Our Chemical Hearts follows two teens named Henry and Grace. Although Henry tries to focus more on getting good grades than on falling in love, he cannot resist himself when he meets Grace one day in his first period class. Although Grace is troubled in every sense of the word, Henry starts falling for her when the two of them are put on the school newspaper committee together. Can Grace’s troubles provide an opportunity for Henry to vent out his own struggles and help her get through hers, all the while forming a happy and healthy relationship? I absolutely loved how adorably quirky and awkward Henry was at times! I found him to be such a sweetheart, and I’m glad that this book was narrated through the eyes of a teenage boy for once. I don’t read too many contemporaries (especially romances) with male protagonists, and this novel was a great refresher in that sense. Grace was extremely mysterious, private, and deeply wounded, and though I didn’t think the romance between her and Henry was the strongest as Grace tended to pine over her old boyfriend, what I did love was their strong friendship. At first I thought that the plot was going to be quite straightforward, but it turned out that there were so many unexpected twists and turns. Good characters are still what will always make me enjoy a book the most, but the book becomes even more of a winner if there is an eventful and fun ride of a plot. All in all, Our Chemical Hearts is one of those stories that tend to break hearts and mend them back together again, as that is what happened to me and likely many other readers as well. The characters had some very interesting and unique quirks, and the plot was at the perfect pace, however, this book just did not have that extra something to bring it all the way up to five stars. I would recommend this book to those who are interested in poignant and eccentric romance tales- I can almost guarantee that you’ll love it! Who are some quirky and unique characters you’ve read about? Are there any books that have broken your heart and then pieced it back together again?